HM Queen Letizia of Spain Presides Over an Award Ceremony. 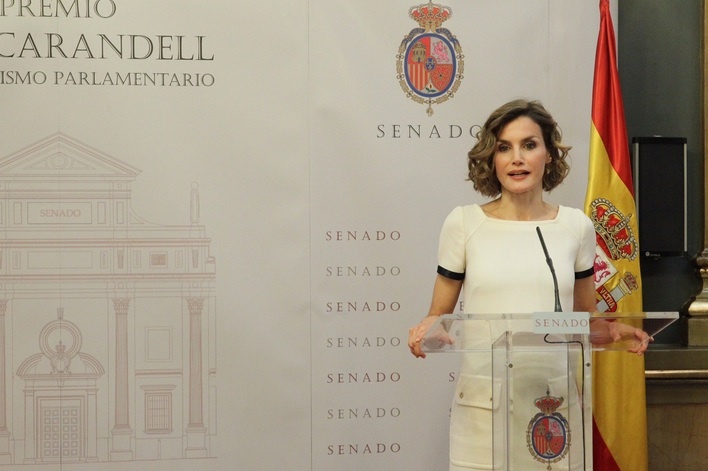 On Tuesday, October 6, 2015, Her Majesty Queen Letizia of Spain presided over the XI Edition of the Premio Luis Carandell (Journalism Awards) ceremony held at Palacio del Senado in Madrid. Previous (VIDEOS) HSH Prince Albert II of Monaco Attends a Conference in Chile. Next (VIDEO) HM Queen Rania of Jordan Visits a Retirement Home.